A chic, sophisticated design coming out of Boston, USA. Set a classy tone for your guests. 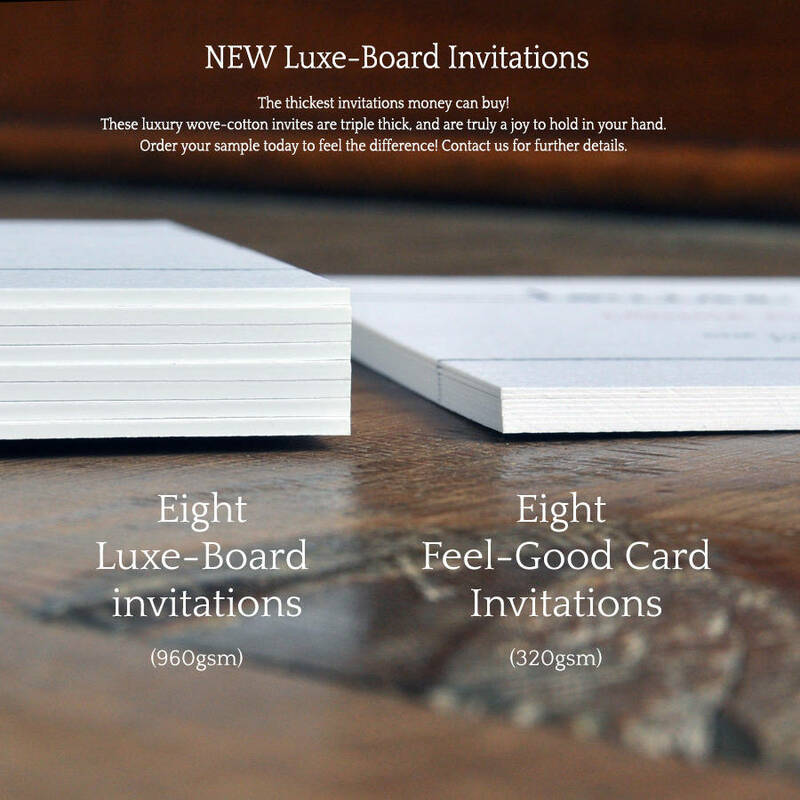 Upgrade to Luxe-Board to create an opulent keep-sake. Your guests will love these exclusive British designed & made wedding save the date cards, which are made from luxury textured card, feature unique designs & a crisp, colourful print finish. We have been designing for luxury events for over 10 years and appreciate how important a high quality and memorable Save the Date card is in setting the correct tone for your wedding day. Also available as a flexible Save the date magnet with a fully magnetic backing. We are privileged to be working with you for your most special of occasions, and it's a real joy for us to be involved. This is why we put extra care into every order and are happy to take all the time required until your invites are perfect. Samples: Samples are non-personalised and are posted the day you place the order. ORDERING: Once you have ordered we will send you a form to complete. Upon returning this to us we will get to work on some first drafts for your review. We can then pass these back and forth, until you are 100% happy to proceed to print. The first 3 free rounds of revisions are free (£20 a round thereafter). You can also request a printed sample of your design for extra peace of mind. Your designs will not be sent to print until you give your final approval. The text & colours can be customised to suit your wedding day. This design can be a concertina, or tri-fold or a single card. Available as Day Invitations, Evening Invitations, Save the Dates, Save the date magnets, Menus, Table Names and Place Names & anything else you require. Custom Wax Stamps also available. To ask any questions before placing an order just click the 'ask the seller a question button.' Or having placed your order, if you wish to get in touch at any time just click the 'contact seller' button. Your designs will not be sent to print until you have approved the proofs which we will send you. 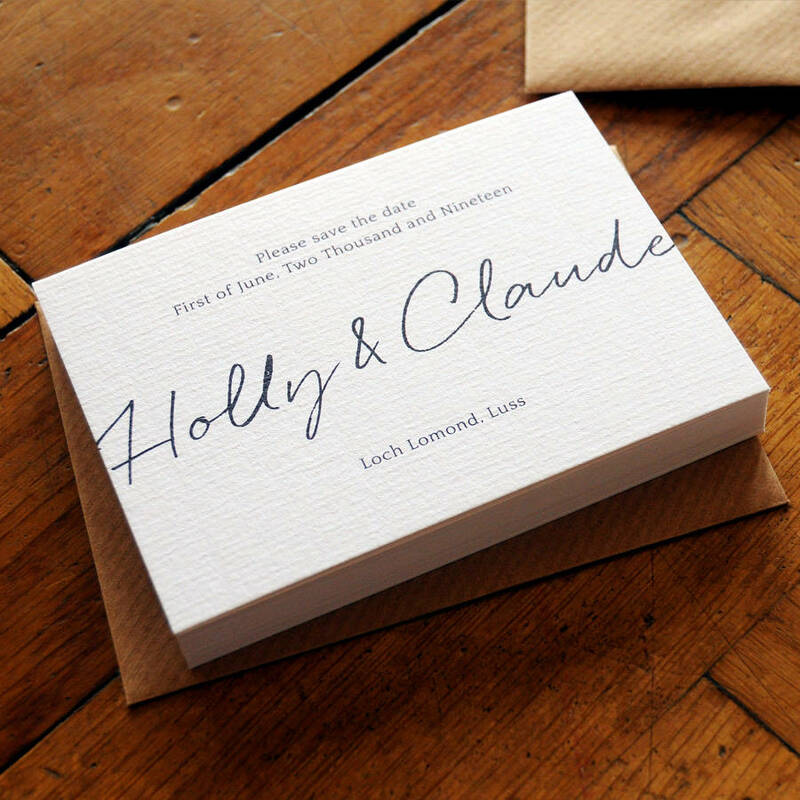 Our feel-good card is white with a subtle texture and watermark signifying very high quality. This luxury card is 320gsm. 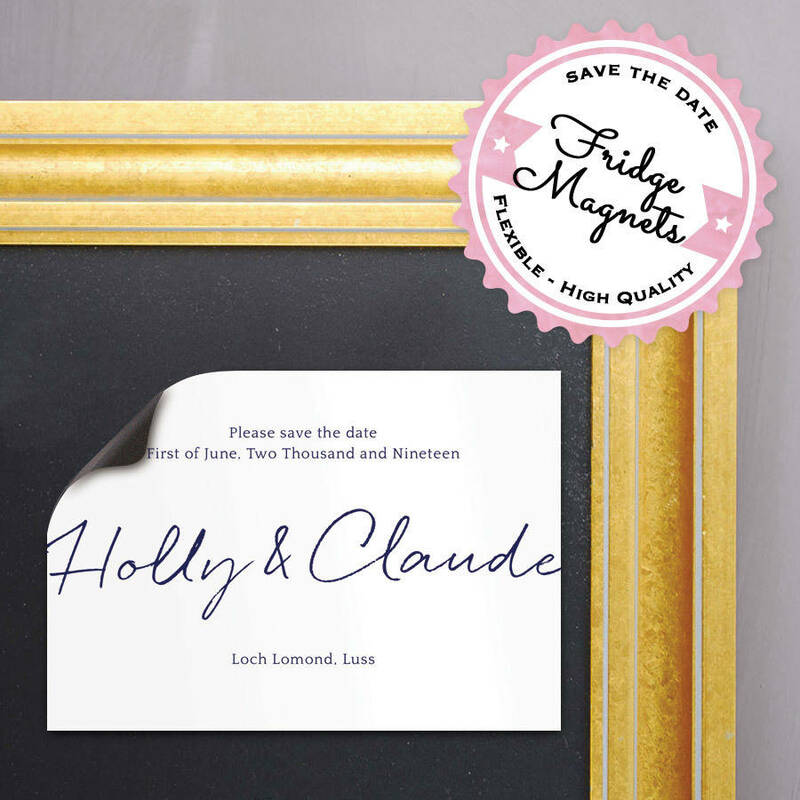 The Save the date magnets have a fully flexible magnetic backing. 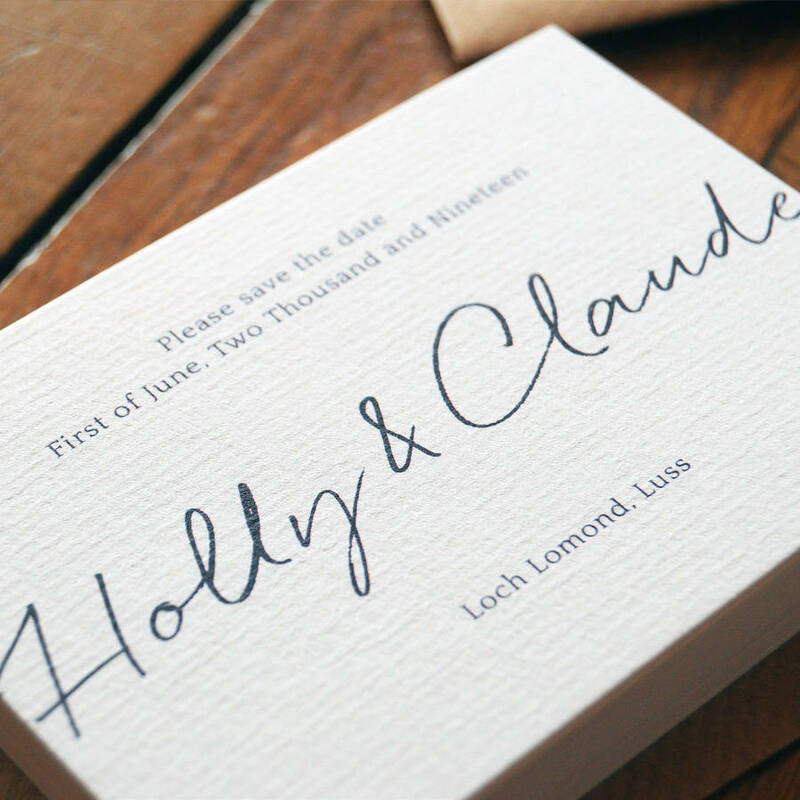 We use lucia pigment based inks which ensure the colours really pop and the blacks are crisp. This ink will not fade for up to 20 years. 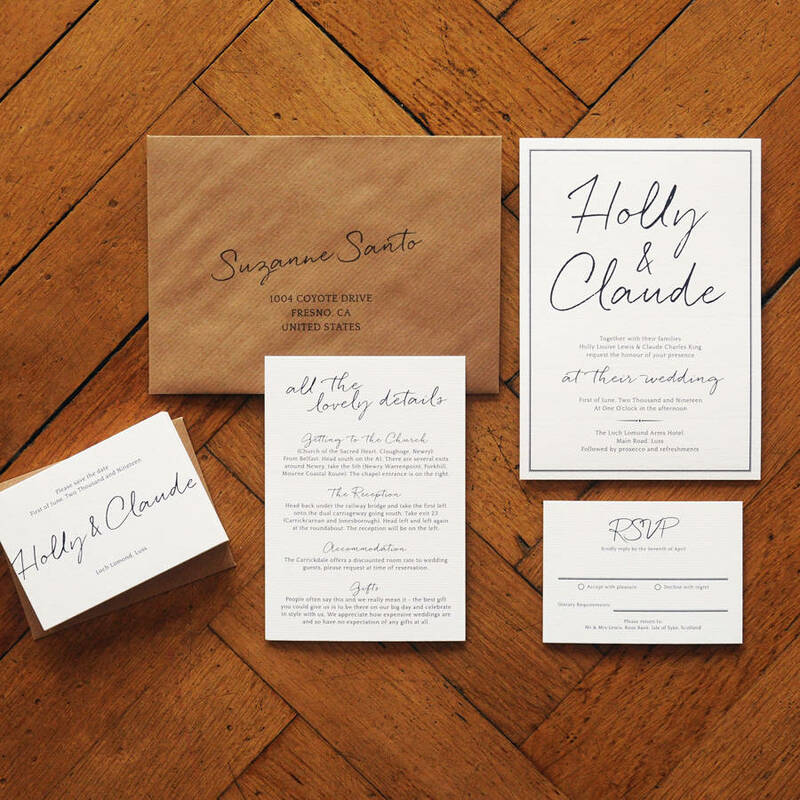 The matching envelopes complement the paper perfectly, and have a subtle texture running through paper. All our products are ethically sourced from FSC forests, which we believe is better for the environment than recycled paper. 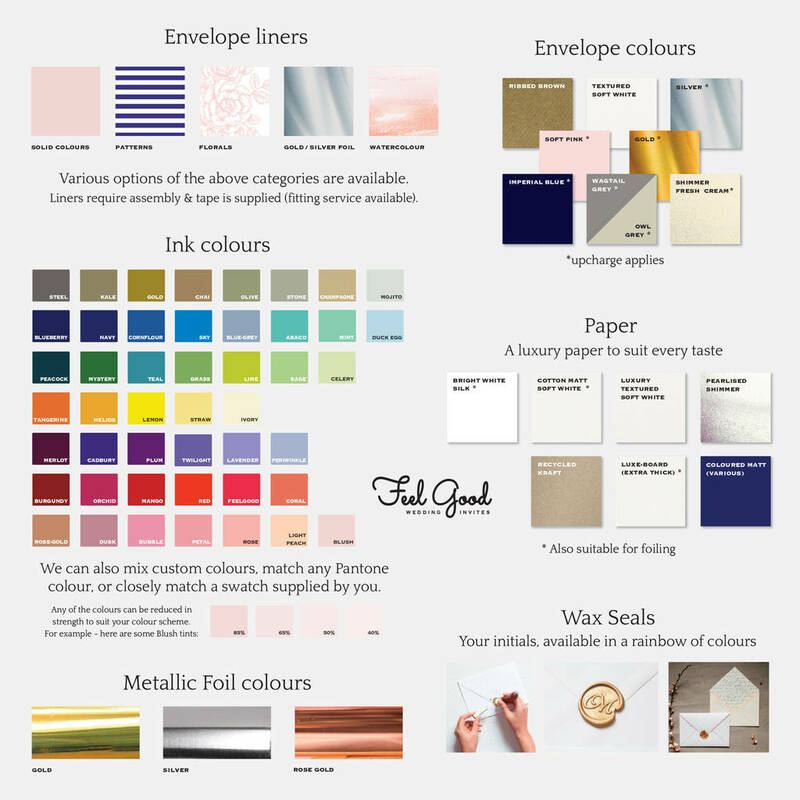 Over 10 years of experience & knowledge of luxury paper goods & design goes into every invitation we produce. Save the Date Cards and Magnets are A7 (10.5x7.4cm). Just ask if you would like A6 (14.8x10.5cm). This product is dispatched to you by Feel Good Wedding Invitations.